Designed to ventilate and efficiently cool large industrial areas. Pull-chain switch activates the 115V, 1ph. ball-bearing, totally enclosed motor. Also includes: steel hub, spider aluminum blades and 18'L cord with 3-conductor plug. 27" dia. base supports adjustable fan column raises from 4-1/27'H. Meet OSHA standards and are UL listed. IN STOCK. Two-speed, 1/3 HP motor withstands temperatures up to 135°F. Includes: chrome-plated steel fan guard and 3 paddles. Three-year limited warranty. SPECIFY: A - Fixed pedestal-mount, C - Wall-mount fixed, D - I-beam-mount fixed. (Not shown) Three-speed, 1/4 HP motor withstands temperatures up to 135°F. 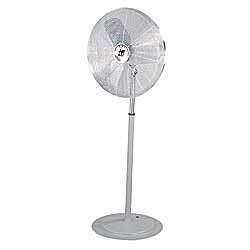 Includes: chrome-plated steel fan guard and 3 blades. One-year limited warranty. SPECIFY: A - Fixed pedestal-mount, B - Oscillating pedestal-mount, C - Wall-mount fixed, E - Wall-mount oscillating. Two-speed, 1/2 HP motor with yellow powder coat fan guard with four silver blades. Post is supported by a wheeled base (not shown), Five-year limited warranty. SPECIFY: A - Fixed pedestal-mount, C - Wall-mount fixed.